The <recycling> element contains configuration settings that control the conditions that trigger IIS 7 to restart an application pool. 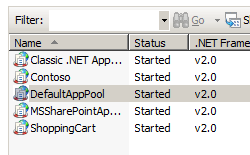 You can also control the types of events IIS writes to the event log when the application pool recycles. 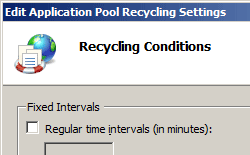 You can specify that IIS recycle an application pool at set intervals (such as every 180 minutes), at a specific time each day, or after the application pool receives a certain number of requests. You can also configure the <recycling> element to restart the application pool when the worker process virtual memory and physical memory usage reaches a specific threshold. You can use the <recycling> element to specify two classes of events to log to the event log when IIS recycles an application pool. The first class contains recycling events that you can configure, such as those mentioned in the previous paragraph. The second class includes run-time recycling events, such as on-demand recycling events, recycling events triggered by configuration changes in the application or applications running in the application pool, or recycling caused by an unhealthy Internet Server Application Programming Interface (ISAPI) filter or ISAPI extension. IIS 10.0 The default value of the logEventOnRecycle attribute was modified in IIS 10.0. IIS 8.5 The <recycling> element was not modified in IIS 8.5. IIS 8.0 The <recycling> element was not modified in IIS 8.0. IIS 7.5 The <recycling> element was not modified in IIS 7.5. IIS 7.0 The <recycling> element was introduced in IIS 7.0. IIS 6.0 The <recycling> element replaces portions of the IIS 6.0 IIsApplicationPools metabase property. 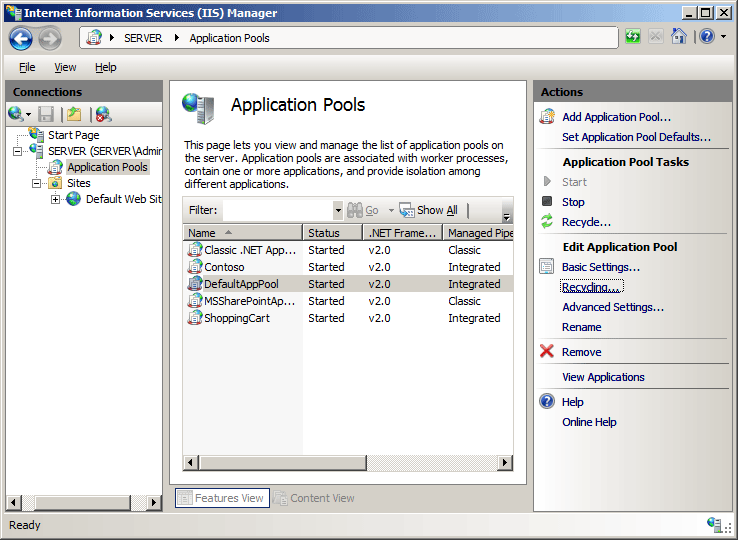 In the Application Pools pane, select the application pool you want edit. On the Recycling Conditions page of the Edit Application Pool Recycling Settings Wizard, select at least one of the options in the Fixed Intervals section, type values into the appropriate text boxes, and then click Next. (Optional) On the Recycling Events to Log page of the Edit Application Pool Recycling Settings Wizard, select the configurable recycling events and run-time recycling events that you want IIS to send to the event log when they occur, and then click Finish. The <recycling> element is configurable at the server level in the ApplicationHost.config file. Specifies whether the WWW Service should start another worker process to replace the existing worker process while that process is shutting down. The value of this property should be set to true if the worker process loads any application code that does not support multiple worker processes. Specifies whether the WWW Service should rotate worker processes in an application pool when the configuration has changed. 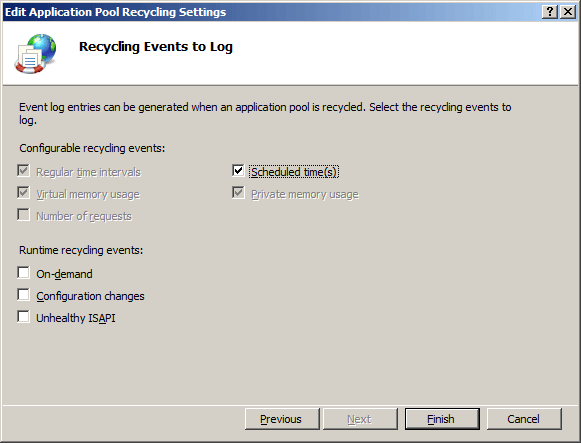 Specifies that IIS should log an event when an application pool is recycled. 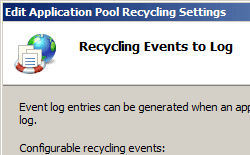 The logEventOnRecycle property must have a bit set corresponding to the reason for the recycle if IIS is to log the event. Log an event when an application pool recycles because of a configuration change. The numeric value is 64. Log an event when an application pool recycles after an ISAPI extension reports to the worker process that it is in an unhealthy state. 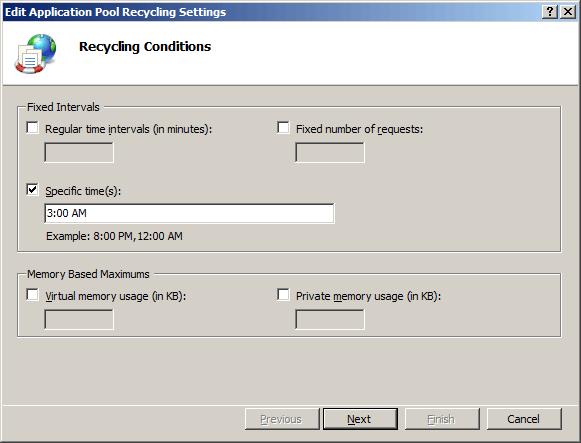 Log an event when an application pool recycles after it uses a specified amount of virtual memory. Log an event when an application pool is recycled immediately to correct a problem. The numeric value is 32. The numeric value is 128. Log an event when an application pool recycles after it reaches a configured number of requests. Log an event when an application pool recycles after it reaches a configured time of day. Log an event when an application pool recycles after a configured time. Specifies conditions under which application pools are recycled. The following code examples add an application pool named Contoso to your IIS 7 server, then set the application pool to daily recycle at 3:00 A.M.